This infographic summarises the influenza season 2017-2018. Influenza activity started in week 47/2017 and returned to baseline levels in week 18/2018. In northern and south-western Europe (EU/EEA) , the activity started to increase between mid-December and early January, similar to the timing of the 2016–2017 season but earlier than in the previous five seasons. During the 2017–2018 season, 41 315 specimens from sentinel primary care providers were tested for influenza, 22% more than in the previous season; 49% of the specimens were positive for influenza virus (previous season: 40%). 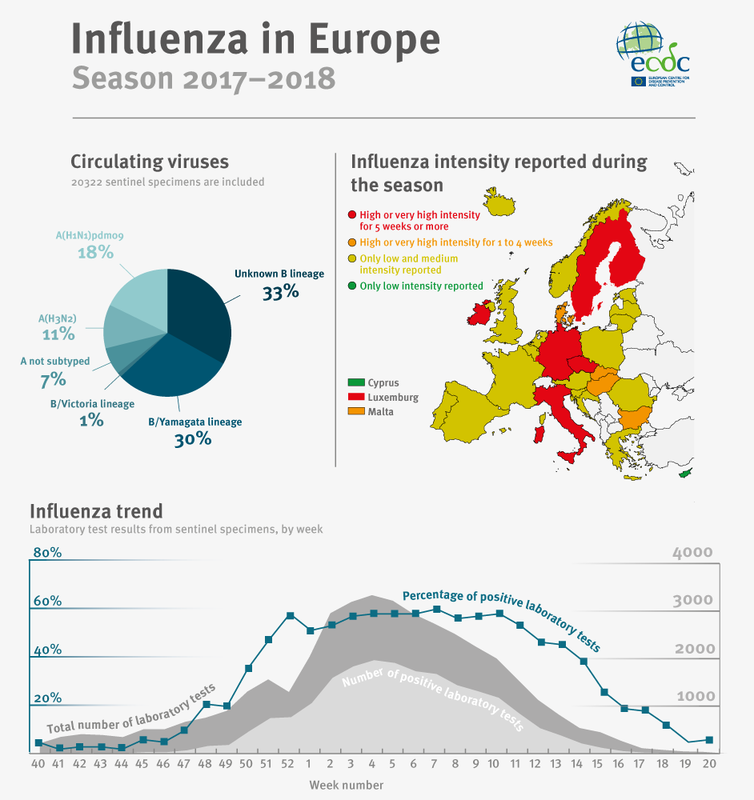 In the Influenza season summaries you find the ECDC main outputs during the influenza season as well as an Infographic showing a summary of the season. ECDC collects, analyses and disseminates surveillance data on 52 communicable diseases and related special health issues from all 28 European Union Member States and two of the three remaining European Economic Area (EEA) countries (Iceland and Norway).